A fascinating country that needs little introduction, Turkey’s charms are plentiful. From its rich history dating back to the 3rd millenium, 18 UNESCO heritage sites and natural wonders, down to its diverse food culture and vast landscapes, there are so many reasons to plan a visit to Turkey. 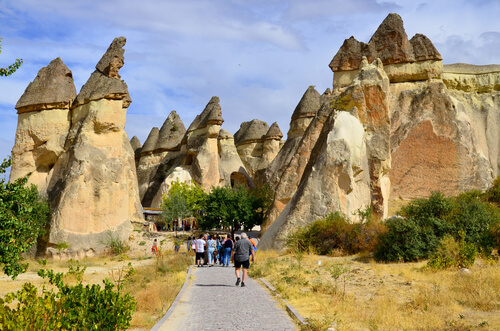 An essential stop while in Cappadocia, this UNESCO heritage complex of ancient monasteries is a stellar example of rock-based architecture with eleven cave churches hailing from the 10th and 12th century. While a number of the frescos have been compromised by the elements, the stunning Karanlik Kilise – thanks to its lack of light – holds vivid frescoes depicting Christ on the cross and the Betrayal of Judas. While in Cappadocia, it’s essential to visit one of the 36 underground cities. While the deepest one is Derinkuyu, the widest remains Kaymakli (there’s apparently a 9 km tunnel connecting the two), which dates back to Hittites (Anatolian people) circa 1200 BC, and used by the locals up until the 13th century. With 600 doors, the city’s inclusion of cellars, churches, wineries and stables and even a school, it’s a fascinating look at life below ground and the complex infrastructure and architectural skills required to live in a subterranean city. Built in the 6th century during the reign of Justinian 1, this captivating Byzantine structure with 336 towering marble columns (look for the two that sport a Medusa head) is the largest cistern in Istanbul. Located close to Hagia Sophia, its water filtration system was originally built to service the Great Palace and supplied water to the Topkapi Palace from the Ottoman era till modern times. Said to store up to 80,000 m of water delivered by 20 km of aqueducts from a reservoir near the Black Sea, today it only holds a few feet of water but its presence more than adequately illustrates this engineering marvel of ancient times. 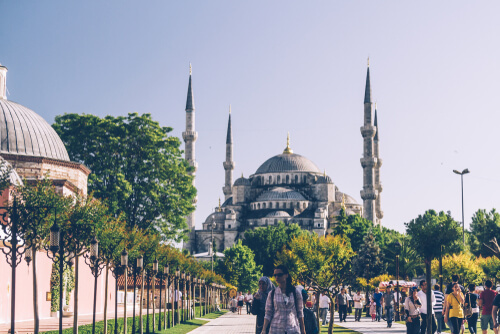 A majestic example of Ottoman-era architecture, the Blue Mosque (also known as Sultanahmet Mosque) with its distinctive facade and six minarets is as memorable on the outside as it is inside. Built between 1609 and 1616 by the architect Mehmet Aga, it was constructed as a complement to the Hagia Sophia. Famous for its elaborate ceramic interiors with over 20,000 ceramic Iznik tiles depicting floral designs, along with hand drawn paintings and calligraphy art of Quranic verses, it’s best visited in the evenings at least an hour before the call to prayer. As it's a working mosque, a modest dress code is required and non-worshipers are to enter by the north entrance (entry by donation). Few buildings will leave you as awestruck as the Hagia Sophia. With a rich history that dates back to AD 537, it has served as a Greek Orthodox cathedral, Ottoman imperial mosque and is now a museum. Considered by many as one of the most important Byzantine structures, its massive dome – under which many emperors have been crowned – was considered an engineering marvel when it was built. Today it’s a pertinent symbol of inter-faith harmony and the walls of the main hall sporting symbols of Christianity alongside rounded calligraphy panes containing the names of Allah, Muhammad and four caliphs is a sight that should not be missed. A UNESCO heritage site, the ethereal beauty of Pamukkale (also known as ‘cotton castle’ in English) is impossible to put in words. A natural wonder that’s deserving of numerous selfies, the white travertine terraces that cascade down a slope closely resemble a snowfield and is best captured at dusk when the sun casts a particular glow off its gleaming white surface. This famous arch in Turkey’s capital is Antalya’s most beautiful monument . As one of the main entrances to Kaleici (the city’s historic quarter), it was built in AD 130 to commemorate the visit of Emperor Hadrian and discovered by Irish-British hydrographer Rear Admiral Sir Francis Beaufort in 1817. Designed to resemble a Roman triumphal arch, the archways tower more than 8 meters high and is built entirely out of white marble, except for the granite columns. Visitors will notice the original walkway where deep grooves caused by the passing of carts through the city can be seen through perspex flooring. 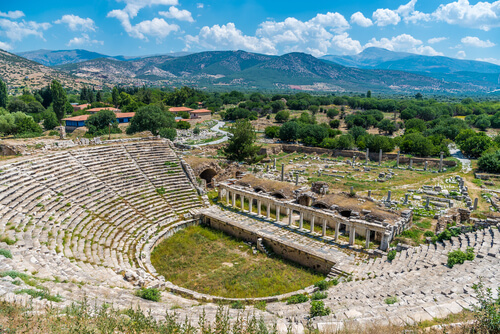 For history (and lovers) buffs, a visit to the UNESCO heritage site of Aphrodisias is a must. An ancient Greek Hellenistic city named after Aphrodite, the Greek goddess of love, it’s located in the village of Geyre and claims the Temple of Aphrodite as its main highlight. Plan to spend a couple of hours exploring the numerous sites, as aside from the temple, there’s a well-preserved stadium built to accommodate up to 30,000 people, an odeon from the Antonine or early Severan period, and many still legible ancient inscriptions. Like many other old towns, Kaleici exudes a unique charm with its historical houses, narrow streets and old harbour. An excursion that’s easily covered on foot, seek out the Tekeli Mehmet Pasa Cami, a 18th century Ottoman mosque, the ruins of Kesik Minare Cami (also known as Broken Minaret Mosque) first built as a Roman temple in 2nd century BC but later converted to a mosque with a minaret added in the 13th century, and the Suna-Inan Kirac Kaleici Museum housed in an former Orthodox church. For non-history buffs, settle in port side for a leisurely meal or take a stroll to the Karaalioglu Park at sunset.